Welcome to my personal blog. I love party planning and have had heaps of fun over the years putting on parties for my four children. Check out my blog, make some comments, share with your friends. I hope you all enjoy. If there is anything I can help people with please let me know, I am happy to help out where I can. 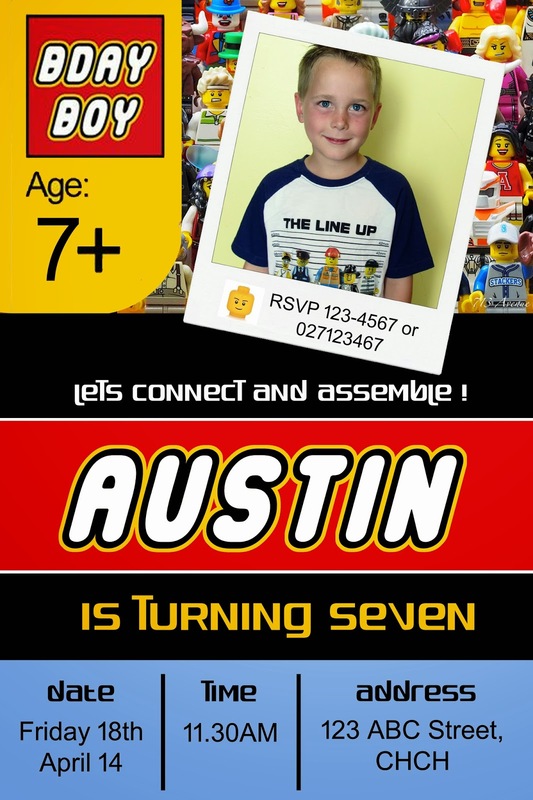 We sat down with Austin trying to explain he wasn't having a party this year instead he could have a friend over and we would go to the Lego Movie. 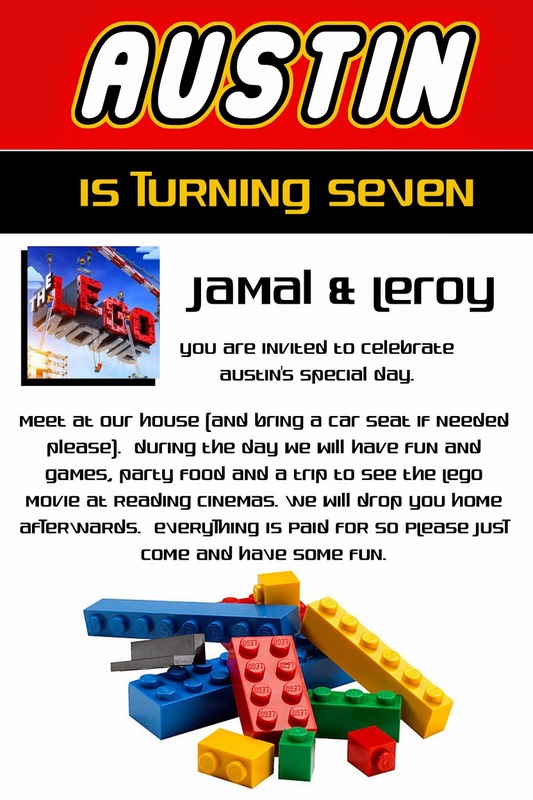 Next day at school we had lots of very excited kids saying they couldn't wait to come to Austin's Lego Party, it didn't work out as expected :) So the party planning began... we decided on a Lego party since all my three boys are Lego mad and the latest movie out at the theatre was 'The Lego Movie'. It was quite late notice so I ordered a Lego Movie Cake topper for Austin's birthday Cake. It was nothing flash but he loved it and so did his friends. We already had a Lego Brick and Lego Minifigure mould so we made chocolate bricks and minifigures for the guests. Austin loves Jelly so we made three colours, (our party theme colours) Yellow, Red and Blue and printed out some little Lego Men to decorate the front of the cups. Austin and his brothers Jamal and Leroy made some containers out of their lego for the spoons, serviettes and chocolates. They looked great on the table. We asked friends on Facebook for Baby Food Jars which we spray painted yellow and drew Lego Head faces on them. They were filled with lollies for each guest and put on the table along with Lego City Plates and Cups. In the kitchen near the food table we hung huge Lego backdrops that we had brought at a fair a few years earlier. All the boys used their lego from their rooms as decorations around the house. The house looked very Lego themed by the time they had finished. Our Lego Head Jars we made. Austin has learning delays so to help him with learning to spell his name we created together an AUSTIN Name Banner. We printed out Lego Minifigures with letters on his name on each man then laminated them and attached them to a red bunting we already had. He loves it so much and will end up being put in his bedroom. Unfortunately the weather was terrible on the day of Austin's party, luckily we had prepared quite a few games to play inside just incase. Two days before the party Austin informed me that he was looking forward to hitting his Pinata. I hadn't even thought of making one so thanks to the internet we came up with a great design that was easily created and during the day we had a dry spell so could hit it outside. Piñata - We made this huge lego pinata out of an old box and lids. Glued them on and covered with yellow paper. Inside we put lots of lollies, toys and confetti so when the pinata was broken open there would be a huge mess everywhere. Pin the Head on the Minifigure - We brought a huge piece of paper and some coloured pieces, cut the shapes out to make it look like a giant minifigure. Each guest was given a lego head shape to try and pin on the minifigure in the correct place while blind folded. Lego Toss - We made this game out of of strips of coloured paper and added numbers to the front which let the kids know the score they got when they threw the lego pieces into the rings. They loved playing this game and had a couple of rounds each. I was really surprised at how many bulls eyes the kids got. Lots of fun! Lego memory Game - guests had 3 minutes to memorise all the lego on the board. The board was then covered and they had to write down as many of the pieces they could. Some kids could not write so drew the pieces. The winner got 16 items. Great effort. We also had a Lego Building Competition. Highest tower and most creative. I gave each kid a personalised Master Lego Building certificate that we had laminated. Off to the Movie Theatre. Lots of excited kids with car seats bundled into our two cars. We drove to the movie theatre to see the latest Lego Movie that had come out at the theatres the day before. I made little treat bags for each guest with popcorn, mini teddy biscuits, lollipops and chocolates. We had brought the tickets during the week to make sure we would get seats and so pleased we did because it was Good Friday and everything around town was shut apart from the Movies and it was packed. We lined up for drinks and ice-creams then went into the threatre. We had great seats and the best behaved children there. I was so proud of them. The movie was fantastic and everyone was so pleased they got to see it with Austin for his birthday. Austin helped me make loot bags for all his friends. In the loot bags we put a building block set (similar to Lego but only $1.50 each), bubbles, lollies and a few other treats. 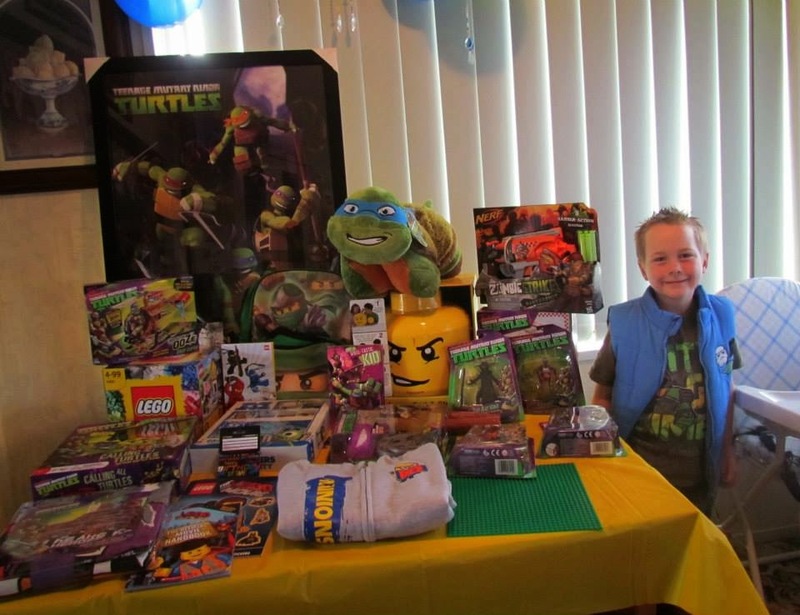 A huge big thank you to all Austin's friend who came and made his day wonderful and for the great presents. He had such a great day and is still talking about it. The next day was Austin's actual birthday. As a family we went to the new Inflatable World and had an absolute awesome time. Afterwards he requested Burger King. Two huge days in a row followed by Easter Sunday and a trip down South to Visit Nanny & Pop made my little 7 year old very exhausted. I am a stay at home mum, happily married since 02/02/02. I have three gorgeous boys, Jamal, Leroy & Austin, who keep me very busy and now a beautiful little girl called Willow. I am very family and friend orientated and love putting on parties where we can all get together and have a great day. PennyCherry2013. Awesome Inc. theme. Powered by Blogger.